The Japonic (Japanese and Ryukyuan) portmanteau language family and the Korean language have long been considered isolates on the fringe of northeast Asia. Although in the last fifty years many specialists in Japonic and Korean historical linguistics have voiced their support for a genetic relationship between the two, this concept has not been endorsed by general historical linguists and no significant attempts have been made to advance beyond the status quo. Alexander Vovin, a longtime advocate of the genetic relationship view, engaged in a reanalysis of the known data in the hope of finding evidence in support of this view. 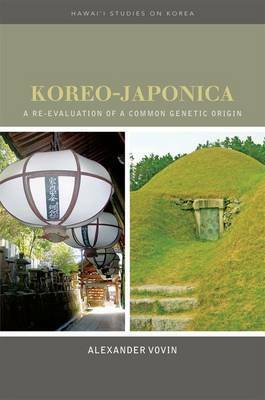 In the process of his work, however, he became convinced that the multiple similarities between Japonic and Korean are the result of several centuries of contact and do not descend from a hypothetical common ancestor.In Koreo-Japonica, Vovin carefully reviews recent advances in the reconstruction of both language families. His detailed analysis of most of the morphological and lexical comparisons offered so far shows that whenever the proposed comparisons are not due to pure chance, they can almost always be explained as borrowings from Korean into a central group of Japanese dialects from roughly between the third and eighth centuries A.D. The remaining group of lexical (but not morphological) comparisons that cannot be explained in this way is, he argues, too small to serve as proof of even a distant genetic relationship.In this volume, a leading historical linguist presents a significant challenge to a view widely held by Japonic and Korean historical linguistics on the relationship between the two language families and offers material support for the skepticism long espoused by general historical linguists on the matter. His findings will both challenge and illuminate issues of interest to all linguists working with language contact and typology as well as those concerned with the prehistory and early history of East Asia.